This is Copenhagen. Lovely fur coat, heels, massive handbag dangling from the handlebars, basket. Waiting casually for the light to change. Ironically, this shot wasn't even meant to happen. I was wearing gloves and trying to adjust the ISO when the camera clicked. I was aiming to take a photo of the cross traffic flowing past in front of me. 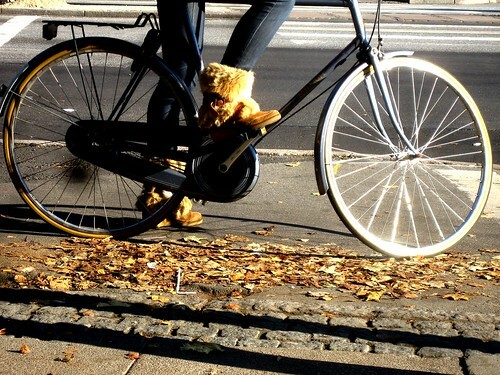 Instead, I got a brilliant spot of winter cycle chic that really says it all about cycling in Copenhagen. Meanwhile, on another street corner.. I somehow find fur not to be too chic. I think is the whole idea of killing an animal just for its cosmetic use. Chic in my opinion is quite the opposite of barbaric. Any theories out there in fashion land as to why the anti-fur lobby is strongest in anglo-saxon countries? Particularly in countries that are often most eager to go to war? I think fur isn't chic just among that segment of the population who are also most against warfare. The war-lovers, it seems to me, are the same ones who are most into the "dominionism" "My way is the right way" crowd who go for the luxury of fur no matter what the consequences. nobody said furs were green. if you want to wear green clothes, buy a field and grow your own hemp. how can it be 'anti urban biking'? if you wear a fur on a bus is it "anti-collective transport"? if you go for a walk on the beach is it "anti-seafront environment"? This blog highlights how people ride their bicycles wearing their normal clothes, found in their closets. If people don't like the clothes some of the people have on in our photographs, I can't do much about that. People are dying around the world because of poverty and disease and war. 40 million people live under the poverty line in america alone. people happily buy clothes from nike and Gap without investigating whether child labour or uncivilised working conditions are involved and then complain about furs, which have been a part of the Homo Sapiens wardrobe for 250,000 years. Hi, I made the original comment saying that fur isn't chic, and I don't come from an Anglo-Saxon country. I also happen to work for Zara, really enjoy your blog, support Oxfam and Unicef and spend a lot of money in nice cloths. And I don't apologise for it. So careful with your assumptions Mikael, because I just think that wearing the skin of an animal that had a nasty death just to satisfy someone's lust is not very chic. As we say were a come from: matar a una zorra para vestir a otra. i'm still curious about the anglo-saxon question, though. and thanks for my new pair of Zara jeans i bought the other day! oh! it's our pleasure, enjoy them! Indeed! Fur coat is NOT chic. And Mikael, green is chic. And where Nike or Gap stuffs come from is not a excuse to kill animals just to satisfy our vanity ego. I don't like spandex, but still I do prefer lycra than animal skin. I have to agree that fur is not chic. It offers no real advantages to other, less expensive, less cruel options and gives the look of a tacky status symbol. Actually, I heard a story on the CBC (canadian brodcasting corporation) radio that said the fur industry was trying to 'rebrand' itself as green, via the fact that raising the animals for coats is sustainable and renewable...much more so they say than alot of man made fibres that are being used. I'm still scratching my head at that one a few days later wondering what to make of it. I'm no anti fur activist, but it's pretty well known just how cruel the methods are that are used to produce those vanity statements. Check out http://www.furisdead.com/. Corporate fur farms are really despicable places. And please don't assume that everyone living in an anglo saxon country is eager to go to war. Millions of us opposed the war and spent a lot of time and money working to prevent it and then stop it. In fact, there was a majority against the war in the US before it started and once the "support the troops" jingoism died down. You'll find much more overlap among war mongers and fur wearers/defenders than among those of us who choose to wear more humane clothing. Fur may have been in the anglo saxon wardrobe for millennia, but we've rejected slavery, female subjugation, and many other morally repugnant aspects of that heritage. Supporting, by our spending, the needless torture of animals to feed our vanity (we're not talking about medical research here) is another tradition I'd be happy not to see supported on this blog. There are plenty of synthetic and non-cruel natural (e.g. merino wool) fabrics available to keep us warm. Maybe it was a fake fur. I hate to say it, but if you want to avoid female subjugation and slavery, then you better learn how to sew your own clothes. Everything is tainted. The bikes we ride are made with metals that the earth had to be ripped open to obtain, and the chemicals used to process them are poisoning the entire third world. Our bike paths seal up thousands of miles of former plains and forests (which were deforested in the Crusades, but still...) Everything comes with a price. At least with fur there is no hiding it. It is right out there. Do you know how much sludge was created to make your bike tires? How about the factory cow that makes Brooks saddles? Do you use organic castille soup, 'cause if you don't, your soap's lye byproducts are fouling a river near you. Fur is easy to hate. Nike and Gap aren't chic, war is not chic, hunger is not chic. Living in an Anglo-Saxon country might not be chic. Riding a bike is chic! None of the above will make wearing fur chic! Sometimes one needs to look around and say: Yeah, I am wrong and I will change! I am not supporting greater evils, I am suggesting that we should all look at things more completely and not take the easy out. Most people oppose fur because it is easy to see where fur may be a problem and they don't have to do anything to follow through- who can afford a mink coat, anyway, so saying "I won't wear fur" is weak. There is no sacrifice involved. If we all look at the real impact of what we do, especially the things we hold to be the most ecologically helpful, we will have a greater ability to actually decrease our individual impact on the earth.